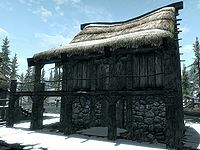 Thaumaturgist's Hut is an alchemy shop in Morthal. The shop is located across from Highmoon Hall, where its proprietor Lami runs the shop during normal business hours (8am - 8pm). There are two floors, each with their own entrance. However, the doors are never locked, possibly because it has the only alchemy lab available in Morthal. If you are on good terms with the owner, all the lower value ingredients and potions found here are free to take and respawn every few days. No one lives or sleeps here and there are no beds in the building. There are two swamp fungal pods near the building, one near the front door and the other around the back next to the stairs leading up to a balcony. The balcony winds around the building and at the front is the second entrance. The main entrance is on the ground floor and enters into the shop. Opposite you is a fireplace, on the mantlepiece are several potions sold by Lami. To the right of this, coming out from the east wall is the counter. On the counter is a bottle of alto wine and a bottle of wine and under the counter are three small coin purses. Behind the counter against the south wall are a cupboard and set of shelves holding more potions and ingredients sold by Lami and four bottles of wine, two bottles of alto wine and a bottle of Nord mead. Between the cupboard and shelves is a barrel of ingrdients and a pile of food sacks. To the right of the door is a dresser holding more ingredients sold by Lami, a gourd, a potion of minor healing, a loaf of bread and an eidar cheese wedge. Next to the dresser is an unlocked chest. To the left of the fireplace is a rack hanging from the ceiling holding four pheasants. Under this is a barrel of food and to the left of the barrel is an alchemy lab. On top of the lab are more ingredient and potions you can buy from Lami and a weak frenzy poison. There are stairs against the north wall leading to the top floor. Under the stairs is a pile of firewood and several barrels, on top of these are even more ingredients sold by Lami. At the top of the stairs, against the east wall is a long wooden table and bench holding two bottles of alto wine, several loaves of bread, several wedges of cheese, two chicken's eggs that you can buy from Lami and two pieces of salmon meat on a wooden plate. To the right, still against the same wall is a set of shelves holding an iron mace. 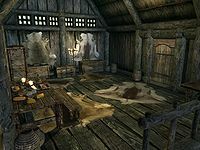 Against the south wall is an unlocked chest with dressers on either side holding four common books, a bowl containing three bottles of skooma that are sold by Lami, two bottles of alto wine and five loose coins. There is a door to the outside in the middle of the west wall and a square wooden table to the right. To the right of the table, above the stairs are two food barrels. This is the merchandise found in Lami's merchant chest. These items are only available if purchased from the merchant; they cannot be pickpocketed or stolen. They are restocked every two days. Since Lami doesn't live here, the opening hours are approximate. She doesn't leave her house until around 8am and it may take her an hour to walk to the shop. A copy of the Destruction skill book Response to Bero's Speech can be found on top of a shelf on the bottom floor, next to a troll skull.